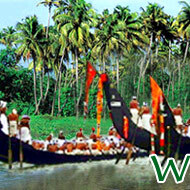 In this section of "Kerala at a glance", we have pieced together facts and information on Kerala. Location: Southwestern part of India. 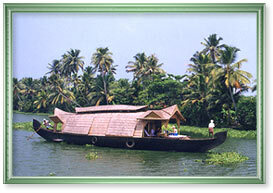 Sited on the south-western coast of India, Kerala, nicknamed as God's Own Country, is a treasure of enchanting natural beauty, coupled with spectacular landscapes, giving every visitor hordes of reasons to be attracted towards this magnificent paradise. 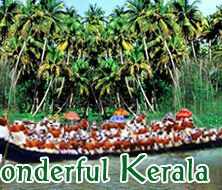 Be it the pleasant and soothing climate or the exotic wildlife, be it the pristine and sun-kissed beaches or the impressive backwaters, be it the large swaying coconut palms or the simply incredible hill stations, be it thrilling festivals or the relaxing Ayurvedic treatments, you have every reason to firm your steps in the land of miracles and charming beauty. The distinctive features and welcoming geographical location of Kerala makes it one of the most beloved and desired holiday destinations across India and the globe. The fascinating and rich flora and fauna of the state add to the list of reasons to pay this simply awesome and remarkable destination a worthy visit. Idyllically positioned on the Malabar Coast of southwestern India, Kerala is encircled by Tamil Nadu in the east and Karnataka in the northeast. To the west lies the sparkling Arabian Sea, while the south is enclosed by the Indian Ocean and islands of Lakshadweep and the Maldives. The equatorial climate round the year makes it ideal to visit Kerala across the year without worrying about fluctuations in seasons experienced here. The sky-touching mountains, splendid gorges, and far-fetched deep-cut valleys in the form of Western Ghats add to the pleasant and enjoyable climate of Kerala, perfect for all kinds of tourists and visitors flocking in here in huge numbers. Besides the tropical greenery, Ayurvedic treatments, and stupendous backwaters, what is highlighting about this green state is the highest literacy rate in India with 94.59 %. 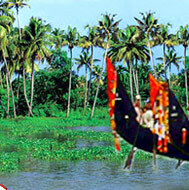 Kerala is also ranked as the least corrupt state in India, as surveyed by Transparency International in 2005.